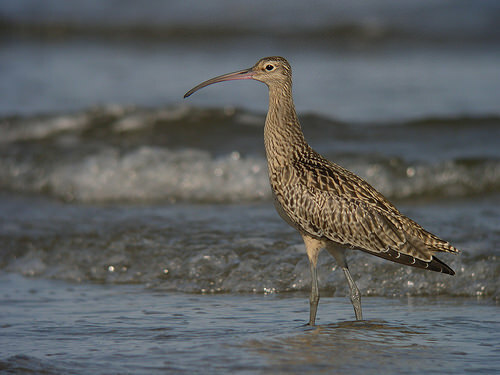 Far Eastern Curlew (Numenius madagascariensis) is the largest migratory shorebird in the world. It has a greyish brown and buff streaked body and a long, down-curved bill that makes it easy for the birds to feed on crabs and invertebrates in the mud. 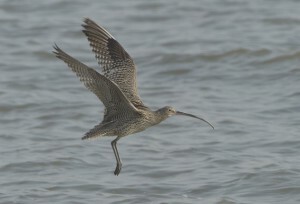 The Far Eastern Curlew is endemic to the East Asian–Australasian Flyway. It breeds in Siberia and Kamchatka in Russia, as well as in north-eastern Mongolia and China. The Yellow Sea of Republic of Korea and China is an important stopover site on migration. This species is also a common passage migrant in Japan and Indonesia, and is occasionally recorded moving through Thailand, Brunei, Bangladesh, Vietnam, Philippines, Malaysia and Singapore. 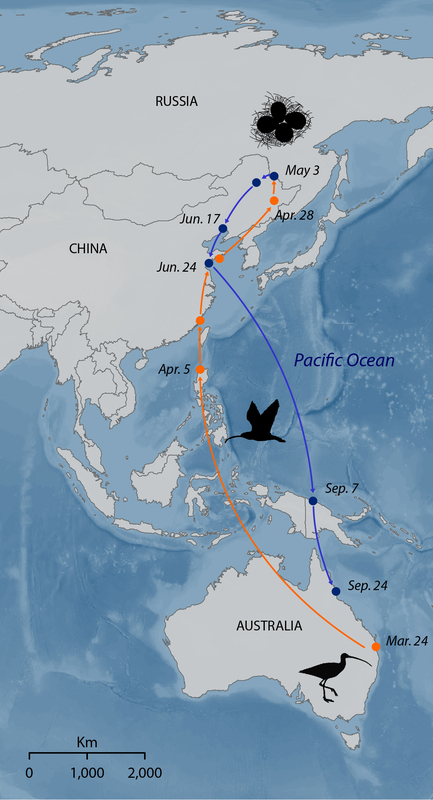 During the non-breeding season a few birds occur in southern Republic of Korea, Japan and China. About 25% of the population is thought to winter in the Philippines, Indonesia and Papua New Guinea. Most (about 73% or 28,000 individuals) spend the non-breeding season in Australia, where birds are found primarily on the coast of all states, particularly the north, east and south-east regions including Tasmania. In the early years of the 21st century, the global population was estimated at 38,000 individuals. The declining global population though, means the true population size is likely to be smaller, and may not exceed 20,000 individuals (BirdLife 2015). In Australia, the species has been declining steadily in the last 30 years by 30–49% and has been assessed as IUCN Endangered in 2015, compared to its status as Vulnerable in 2010, Near Threatened in 2000 and Least Concern in 1990 (Garnett et al. 2011). 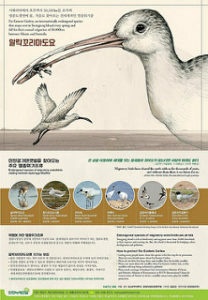 The number of birds stopping over during migration at Saemangeum, Republic of Korea has decreased by over 30% (about 1,800 birds) between 2006 and 2008 due to the reclamation of tidal flats (Moores 2006). Habitat loss and deterioration of this and other staging areas in the Yellow Sea have caused a rapid decline in the global population and further proposed reclamation projects are predicted to cause additional declines. The species is now listed as globally Vulnerable on IUCN Red List. Also, there are concerns that the small population size is an overestimate, and its IUCN status may warrant uplisting to Endangered in the near future. In May 2015, the Australian Government listed Far Eastern Curlew as critically endangered under its national environmental law. In Australia, this species has declined by 81.4% over three generations. As mentioned above, intertidal habitat loss (in some areas estimated at 50% or more) caused mostly by reclamation projects at the Yellow Sea staging grounds is a fatal threat to the species. Wetland degradation caused by environmental pollution, reduced river flows and invasive plants are threatening throughout the flyway (Garnett et al., 2011). Similarly, disturbance and hunting are threats throughout the whole range including breeding, non-breeding and stopover sites (Barter et al. 1997). Human disturbance can interrupt shorebirds’ feeding or roosting and may influence the area of otherwise suitable feeding habitat that is actually used. Far Eastern Curlews take flight when humans are 30–100 metres, or even up to 250 meters away (Peter, 1990). Far Eastern Curlew populations have been monitored every year for the last 30 years at over 20 locations around Australia, organised by the Australasian Wader Studies Group. This program continues through Shorebirds 2020, Australia’s national shorebird monitoring programme, which is coordinated by BirdLife Australia. As Far Eastern Curlew migrates along the flyway, conserving the species cannot be done solely by one country or organization. Governments and the organization related with EAAF should cooperate to preserve the species. Identifying key stopover areas and preventing their reclamation, monitoring population trends, restoring reclaimed wetland sites, and campaigning to stop shorebird hunting in Asian countries are general actions that can be taken. The conservation priorities of CMS include protection from further land reclamation, and other threats, and managing appropriately as much as possible of the remaining habitat at Yalu Jiang National Nature Reserve, Liaoning, China, and at the Yellow River (Huang He) delta, ensuring effective management of shellfish fisheries and polychaetes harvesting at key sites for the benefit of all shorebirds, limitation/stop of hunting at key sites along the migration route (poisoned crabs are put out on tidal flats in China for all curlew species). 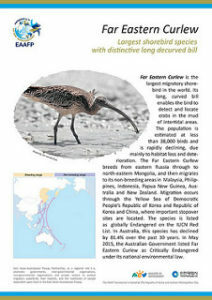 At the EAAFP MOP8, a Far Eastern Curlew Task Force was formed to coordinate the development of a Single Species Action Plan for the Conservation of Far Eastern Curlew. All Partners unanimously endorsed the Task Force which is Chaired by Australia. It is anticipated that this plan will be endorsed at MOP9 in Singapore, 2017.